This is a condition in which the temporomandibular joint of the jaw does not function properly. This is the joint that connects the temporal bone (the bone that forms the sides of the skull) with the mandible (the jaw bone). This situation produces pain, sometimes excruciating pain, in the muscles and joints of the jaw. This pain can at times radiate to the face, neck and shoulders. Headaches, toothaches, dizziness, feelings of pressure and pain behind the eyes, ringing of the ears possibly even difficulty opening or closing the jaw are other symptoms. A person with this condition may find that he or she has difficulty opening his or her mouth all the way. This could be accompanied by clicking, popping and grinding noises that occur during movement of the jaw or when chewing. If left untreated, the cartilage that cushions this joint may become displaced or wear out, like the parts of an automobile engine running without oil. 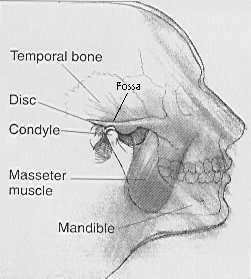 This causes the bones of the jaw to rub together during movement of the mouth. The most common cause of TMJ syndrome is stress that leads to poor bite, and the grinding of teeth called bruxism. Other causes can be poor posture, repeated blows to the jaw or chin, whiplash, and even habitual straining of the neck or shoulders and jaw (as people do when holding a telephone earpiece between them). Poor dental work and orthodontics can contribute to this condition. Poor chewing habits, excessive gum chewing, thumb sucking, and even exclusively chewing on one side of the mouth can trigger a TMJ episode. Hypoglycemia can contribute, because hypoglycemics tend to clench and grind their teeth when their blood sugar is low. TMJ is treatable and can be arrested. A good self-test is to place your little fingers in your ears so that hearing is obstructed. Then slowly and steadily open and close your jaw. If at any point you hear a clicking, popping or even grinding noise, your jaw joints may be out of alignment. In this case it is recommended that you have a professional examine you for this condition. An early diagnosis is important. Your physician may use X-rays and a technique called arthrography, in which an opaque dye is injected into the joint and viewed with a fluoroscope. If it is ascertained that TMJ is present, you will want to add nutritional treatment to whatever prophylactics your physician prescribes. These assist as anti-stress agents. Sublingual forms are recommended here for best absorption. L-Tyrosine, 500 mg daily, taken at bedtime on an empty stomach with water or juice (do not take with milk). The vitamins should be taken with the enzymes for best absorption. This combination improves the quality of sleep and relieves anxiety and depression. Vitamin C is very important in this process, take 4,000 to 8,000 mg daily. This helps to combat stress and is necessary for proper adrenal function. Vitamin C is also needed in order to repair and heal connective tissue. If you are not accustomed to taking that much vitamin C a day, you will need time to adjust to it. Try taking 2,000 or 3,000 mg a day for a week, then add another 1,000 mg a week until you have reached the desired dosage. Vitamin C is a water-soluble vitamin, so it is not possible to overdose on it. However, if you take large amounts without accustoming yourself to them, you may experience gastric distress. Each of these has a calming and anti-stress effect. Be cautious with chamomile; do not use it regularly, as ragweed allergy may result. Avoid it altogether if you already have an allergy to ragweed. If you have trouble sleeping, take valerian root before bedtime. It acts to relax you and calms the nerves. These can also be administered as teas for a soothing result that is warm and relaxing. TMJ sufferers should eat lightly steamed vegetables, fresh fruits, whole-grain products, white fish, skinless chicken and turkey, brown rice plus homemade soups and soft breads. They should avoid high-stress foods! These include all forms of sugar, all white flour products, all junk foods (candy, colas, potato chips, pies and fast foods). Do not consume any foods that contain caffeine, which is a stimulant and increases tension. Avoid over-the-counter medications that contain decongestants, which can have a similar effect. Avoid alcohol as this contributes to bruxism (tooth grinding), which, in turn, aggravates TMJ. Do not chew gum! Avoid hard-to-chew foods, such as tough meats or hard breads. You can give your jaw a needed rest if you fast at least once a month, for anywhere from a day to a week or less. Fasting also helps to detoxify the body, which reduces stress in another way. To alleviate stress and tension, try to become more aware of how you place your body in certain circumstances. At work, periodically check your posture and consciously straighten up if you are slumping or slouching. Avoid leaning over your desk. Keep your back comfortably straight. Try to align your head so it is balanced over your shoulders and not leaning out in front of your torso. Sleep on your back to allow your neck and shoulders to rest and relax the muscles. Avoid propping your head up in bed to read or watch television. Try to avoid sleeping on your stomach or side; that puts pressure on your jaw. If you have are experiencing a TMJ episode, you can apply cold or hot packs to the areas of stress or pain; you can lightly massage the area of your temples and jaw, depending upon the severity of the pain or tightness. Avoid practitioners who advocate only one method of treatment for TMJ. A multidisciplinary team obtains the best results. If possible, seek assistance from trained professionals who are licensed or at least associated with a university dental or medical school. TMJ is often treated with a special bite plate that is worn at night to prevent tooth clenching. It helps to alleviate compression of the jaw. Stress management techniques may also be advised, along with breathing techniques; heat, massage and muscle relaxants can also relieve the symptoms of TMJ. Other treatments may involve physical therapy involving tongue and jaw exercises; ultrasound, which promotes tissue healing. Biofeedback readings taken of the masseter muscle have been found to be effective; also, electro-galvanic stimulation has been found to help relax facial muscles. Be aware that TMJ can be misdiagnosed. Avoid anything that has not proven itself as an effective treatment. Try the above simple, inexpensive methods before you invest in more expensive methods or therapists. Be aware also that there may are other disorders of the jaw that might mask themselves as TMJ, such as rheumatoid arthritis, in which the symptoms are more severe in the morning and ease progressively during the day, unlike TMJ. "I am willing to change the patterns in me that created this condition. I love and approve of myself. I am safe." Affirming this new pattern can assist in alleviating the condition.